Article | Heineken Pull Together their first TVC for Italian beer brand, Birra Moretti. 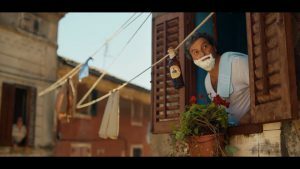 International beer giant, Heineken, have released their first TVC for Birra Moretti, the ‘final piece of the jigsaw’ in scaling the brand. Founded in 1859, Birra Moretti have nurtured their product into the fastest growing alcohol brand in the UK today and have stood true to their motto, ‘great beer, great food, great company’ in their new ad. After launching ‘The Gran Tour’-their biggest food and drink experience yet at British Summertime Festival last week, TV seems to be the logical marketing stepping stone for the Italian beer brand after already conquering digital and cinema. ‘Pull together’ emphasises making ‘time for what matters’ via an ingenious washing line stunt, bringing to light the importance of switching off and spending quality time with family and loved ones. The concept, developed by St Luke’s, was brought to life by Sonny in a picturesque, authentic small Italian town, with the product becoming the hero of the spot as it sets about its journey uniting loved ones. Smoke & Mirrors’ Flame Operator on the project, Chris Major, comments, ‘The beauty of the rustic Italian village belies the challenge in post that was the removal multiple TV cables, though the resulting spot perfectly fits Birra Moretti’s unique aesthetic – L’Authentica since 1859”.